DAF Breathable 170 consists of a 70 denier nylon taffeta outer fabric coated with a thin layer of polyurethane underneath. Breathable 170 is ideal for use in healthcare pillows and light-weight cushions. Breathable 170 is breathable and water/moisture resistant. Breathable 170 weighs 2.0 oz per square yard. Standard colors are yellow, aqua, and light blue. Custom colors are available on request. Standard width is 58”. Also see the page on Mattress and Support Surfaces for additional fabrics that can be used for cushions and seating. DAF Pique Knit is a light weight economical knit. DAF Pique Knit ‘s two way stretch and soft hand lets this fabric conform to surfaces allowing easy fabricating and patient’s comfort. This pliable pique knit fits many seat cover applications and is an ideal candidate in the healthcare and medical industries. The standard color is black. The standard width is 60”. DAF PU Pique Knit‘s soft hand and pliable construction lets this fabric conform to surfaces allowing easy fabricating and patient’s comfort. This pliable pique knit fits many seat cover applications and is an ideal cover material. The standard color is black. The standard width is 60”. DAF Air Circulating Knit is a low-weight economical polyester knit. This high strength, unique knit fits many cover applications. DAF Air Circulating Knit’s soft hand and mild stretch conforms to surfaces allowing easy fabricating and patient’s comfort. This air circulating knit fits many seat cover applications. The standard color is black. The standard width is 60”. DAF 6300 is a polyvinyl chloride coated 600x300 denier polyester. 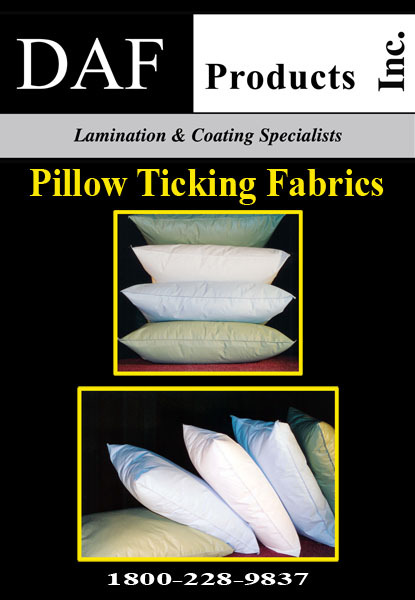 This fabric is a strong economical protective cover material. DAF 6300 is used for slings, transports, bags and other applications where stronger performance is required. The standard color is black. The standard width is 60”. DAF Spacer Mesh is flame retardant and 100% polyester. Spacer mesh is breathable due to its repeated diamond pattern and stretch that promote air circulation. DAF Spacer Mesh is also soft and supple making it ideal for seat cover and cushion applications in the healthcare industry. The standard width is 58”. The standard color is black. Custom colors available upon request. DAF DIP COATED CoverMesh is a poly vinyl chloride coated 1000 denier polyester mesh Fabric that is non-toxic, fire retardant and heat sealable. 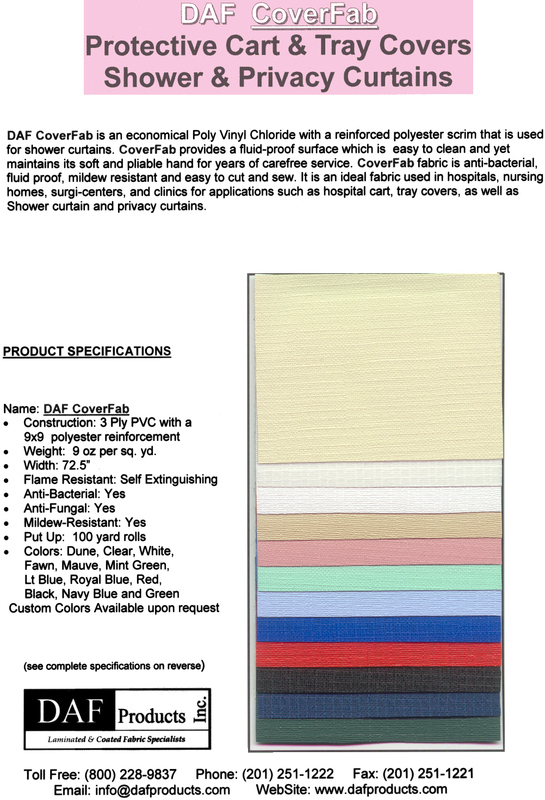 DAF DIP COATED CoverMesh is antibacterial and mildew resistant and a great companion to our DAF Coverfab shower curtain and cart cover fabric. Standard colors are royal blue, black and white. Custom colors available include dune, fawn, mauve, mint green, light blue, navy blue, green and red. It comes in widths up to 72”.